Corning's Gorilla Glass is used to protect billions of mobile device displays. In fact, some of the most popular handsets -- like HTC One (M8), Google Nexus 7, Samsung Galaxy S5 -- feature Gorilla Glass 3 or Gorilla Glass 2. Some companies, like ASUS, are also using it on touchscreen ultrabooks. That's because it fares well under normal usage, offering good protection against scratching. However, things are different when it comes to drops -- as tough as Gorilla Glass may be, it can shatter quite easily when handsets are dropped, potentially leading to damaged displays. Its maker, Corning, says that this is the biggest issue that consumers are reporting. With Gorilla Glass 4, it finally addresses this shortcoming. 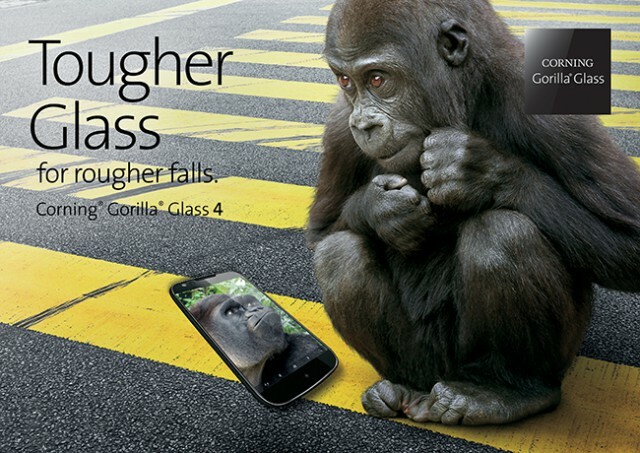 Gorilla Glass 4 is touted to "survive" up to 80 percent of the time, when a device it protects is dropped face-down from one meter (3.28 feet) on a rough surface. That may not sound like much, but one meter is usually higher than pants' pocket-height. It should also translate to better protection against shattering from higher distances, like ear-height. "With Gorilla Glass 4, we have focused on significantly improving protection against sharp contact damage, which is the primary reason that mobile devices break", says Corning vice president and general manager James R. Steiner. "Dropping and breaking a phone is a common problem, and one that our customers have asked us to help address". Needless to say, Corning is touting Gorilla Glass 4 as a superior solution to anything its competitors have at the moment. So when will we see it on our mobile devices? Well, Corning says that sampling and shipping is already under way. Coupled with the usual release schedules, and we might see the first Gorilla Glass 4-equipped mobile devices launching as soon as CES 2015 and MWC 2015.